True confession time: I REALLY like Justin Timberlake. Perhaps it's because 19 years ago when my daughter Kirstie was four I became a single-mom…contrary to many people's experience I actually LOVED the whole single-parent thing and perhaps the most fun part of every day of the year 2000 was bathing little Kirstie to the sounds of her singing along with "Bye Bye Bye," NSYNC's massive hit that made its debut that year. Guess I just have such great associations between that time in my life and Justin Timberlake, they've simply carried over into the present. But besides all that (and even besides the fact I clearly enjoyed this year's Superbowl halftime performance more than any other adult in the room), today's blog has nothing to do with JT. Today I'm here to talk about how the human body is actually meant to move A LOT and in many cultures people spend most of every day squatting, lunging, or at least standing and walking but not us, though. Regardless of the fact most people in the US have desk jobs, it’s also the case that most of our favorite pastimes involve sitting: driving, watching / manipulating some sort of screen while sitting, eating while sitting (BONUS! )…the list goes on and on. And here’s the really big problem with all this sitting: many people now have a great deal of difficulty even feeling much less activating the gluteal muscles which are actually the largest muscles in the body. And how conditioned (or “strong”) the gluteal muscles (or “glutes”) are has everything to do with the conditioning and health of the entire body for lots of reasons. First, they’re attached to the hamstrings and low back muscles (two more of the largest muscle groups in the body…remember that!) so if the glues aren’t firing off correctly pretty soon the hamstrings and low back won’t be working well either. The hip bridge is probably the most common “hip-hinging” exercise as well as a fantastic glute exercise…it might actually be very best glute exercise of all! When the Delaware News Journal asked if they could interview me regarding my perspectives on high quality bodyweight-only exercise I showed them a number of moves including the one below of me doing an elevated hip bridge (in other words a hip bridge with my feet elevated…in this case, on a chair) but there are literally hundreds of variations of this incredibly important movement pattern. And why is the hip bridge so important, you ask? Because it strengthens the muscles used for not just one but a couple of the seven most important movement patterns of all: squat, lunge, push, pull, bend, twist & gait. Turns out that all human movements, from the smallest to the most complex, are nothing more than variations of these seven Pillars of Human Movement. But why else is a hip bridge so important? Remember the good ole' posterior chain? Well I like to think of the posterior chain as a series of links and remember a chain is only as strong as its links, right? So if the glutes become weak, the rest of the chain becomes weak as well. If, on the other hand, the glutes become stronger, the entire chain becomes stronger as well. And here’s yet another great reason why the hip bridge exercise should become your new BFF: because hip hinging exercise (of any kind) is one of the 5 essential components of any high-quality exercise routine. Wanna know more about exactly how to put together a great workout every time? Then my Foundations of functional fitness for ANY body is for you! Whether you’re an exercise novice or a full-blown gym rat (or somewhere in between), you can expect to walk away from this FUN, informative, hands-on workshop with a much better working knowledge of exactly what a high quality workout should always look like plus plenty of tips on how to get and stay fit with little or no equipment no matter where you are. 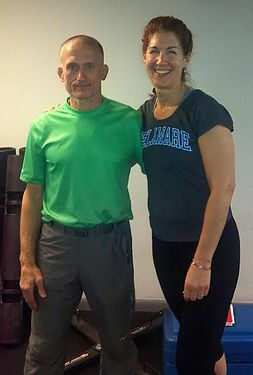 *Arguably one of the top Trainers IN THE WORLD, Steve Maxwell is also considered the “American father of Kettlebells.” In 2013 I was blessed and honored to be trained by him personally…thus began my serious love affair (metaphorically speaking!) with Steve. For more info on Steve and all the AMAZING “People I Like,” click here.